A few weeks ago I wrote a post about things you should know before you turn freelance. Well this week it’s all about productive working once you are freelance. I’ll bet you’ll find some contradictions…but that’s just another part of being your own boss! 1. Get a room of your own. Seriously. If you can, do it. Lock the door. 3. Disable the internet. Yes – disable the internet. Facebook, Twitter, LinkedIn, forums and games all have their place in the workplace, but only if you are taking a break or are utilising them for dedicated marketing or research. When your nose needs to be at the grindstone they are your enemies. Either disable the internet while you work or use a timer that switches off your internet at certain times of the day. If you really need it for research (like I’ve been doing this week) get rid of those tabs with your favourite haunts on them. 4. Make yourself comfortable. Have everything to hand that you’ll need before you start work. Paper, pens, phone, flashdrives, tv remote (no! not the tv remote!! ), nice coloured paperclips. The less often you have to move away from your desk the better. A quick trip to find a new pen often leads to snackage. 5. Avoid housework. Yes, seriously. No popping off to put on that load of washing or do a quick vacuum while you are supposed to be working. Before you know it half an hour has gone and it’s time for coffee. 6. Avoid anyone else in the house. One of the best and worst things about working from home is having to deal with other people, or rather, family. They will not understand. Avoid them while you are supposed to be working. Period. 7. Try to work when the kids are out or asleep. If you are juggling parenthood with freelance working it can be hard to mix the two. Be aware of this… night-time working can be peaceful. 8. Give yourself scheduled break times. It’s much better to have scheduled breaks rather then swanning off whenever you fancy. For one thing it makes sure that you actually take breaks, which can be difficult when you are buried in interesting work, or have a looming deadline. Another good reason is that it can limit caffeine consumption. If you are anything like me you can get permanently attached to the coffee cup… that is when you are not shaking so much that you spill the contents! 9. Break your day into sections. Sounds lame I know, but if the stress hits it can help by making small sections of work manageable. 10. Take the phone off the hook. If you really have a tight deadline phone-calls will only annoy, distract or have you agreeing that you really do need PPI insurance. If it’s important, callers will either phone back or leave a message. Similarly don’t jump whenever you receive an email. Set scheduled times to check what emails are coming in. So there you go. Have fun. Relax. You’ll only be productive if you are not hassled, bored or distracted. Take lunch breaks (it’s important), don’t just drink coffee, don’t eat too much cake but have some if you want some and take the odd day off. 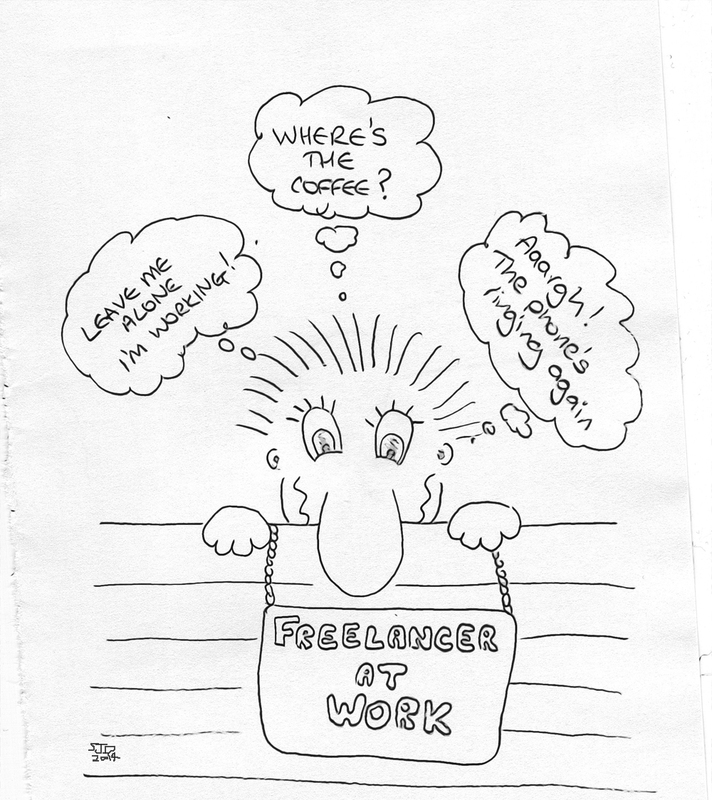 Right, that’s it…the weekly musings of a freelancer part 52. Gotta go, my coffee’s getting cold and I have a mountain of work to do! 3 and 5 are my downfall!